Go buy Sony stock and do it now. 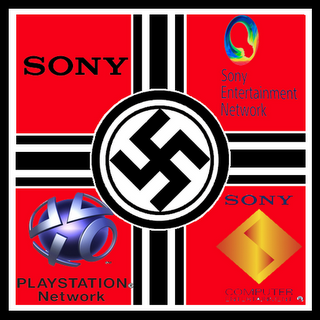 Their business model cannot be matched by any competitor for one very distinctive reason, Sony Nazis. I don’t know how you build an electronics company where sales are not based on cost, time to market, quality, reliability, features, warranty, or any other standard metric. But they did it, wow did they do it. They have loyalty and followers that are rivaled only by beatnik-elitist, tofu-eating, hemp-wearing, Prius-driving, Apple psychos. Get going, you better get in line now for that $700 Iphone 5 release, you don’t want to miss out on the new features. Finally Apple will allow memory expansion, tethering, and the ability to watch standard avi movies. Actually no, that won’t be available on the Iphone 5 either even though Android has offered this as a standard for more than 5 years. Hey, but you do have iTunes, so there is that, and when I say you have iTunes, I mean you are shackled to that bloated pile whether you like it or not. Form over function is what I always say. But I digress. It isn’t without merit though, I think Sony made a good Hi-Fi stereo back in ’77 and it must have been awesome because since then, Sony has been the technological gospel in my extended family…and among some of my “less technically savvy” friends. I have family members that will pay double to have a Sony logo on the screen. They have been programmed to shun other logos and flock to the upper case “S” like a moth to the flame. They will forgo logic, reason, reviews, and raw data to make sure they walk out of the store with a light wallet and deficient product, time after time. So I did some research and figured out why. Come to find out, I've been the fool. Here are some facts. 1) Sony makes you smarter. 2) Sony helps you sleep at night. 3) Sony feeds the hungry. 4) Sony saves trees and guards baby seals. 5) Sony uses no electricity. 6) Sony helps you sustain an erection. 8) Sony will get the girl and win the ballgame….on the same day. 10) Every time a Sony boots, an Angel gets its wings. I think there must be subliminal messaging on the splash screen, because Sony has some serious followers. Don’t get me wrong, Sony does make some good stuff, in some cases, but it has to be pretty damn good to make up for that cost difference. I should rephrase, Sony “packages” some good stuff, because in most markets, they haven’t “made” much for a very long time. For instance, take the infamous Sony Vio. You may ask yourself if Sony makes motherboards, RAM, hard drives, processors, chipsets, fans, screens, an O.S., or really anything that is in that plastic case that says Vio. The answer is no, they don’t, they likely even outsource the plastic case. Then why would I pay virtually double for the box? Good question. Got me, but then again, I’m only an electrical engineer with a Master’s degree that has been working in industry for about 15 years specializing in semiconductors. The fact that I actually build the stuff that goes in the box doesn’t lend me any more credibility than the 19 year old head-banger that works at Circuit City. He defiantly will lead you in the right direction and it has nothing to do with his commission or the fact that he smoked a bowl for breakfast. You may say that Sony invents technology, and you would be right. BluRay is alive and kicking. Glad to see they got something to stick after BetaMax, video8, DAT, Hi8, MiniDisc, Sony Dynamic Digital Sound, HiFD, Super Audio, and Hi-MD. Every one of these was a push from Sony to force compliance and own the market, fortunately technology prevailed. In the case of BluRay they got smart and got the backing of movie production companies instead of relying on the technology or they would have lost the battle to HD-DVD as well. Plus the name BluRay just sounds better. Again, form over function. I guess my ire toward Sony really has more to do with their ability to create drones and instill loyalty that the Taliban would covet than their mediocre products sold at ridiculously high prices. Though as a way of building a company (or religion for that matter), it really is something to be admired. That being said, I’ve got to give them 2 stars for mind control. Well done Sony, hire more marketing and less engineering, your business plan is working perfectly.